Luis Mendez, left, a student at Miami Dade College, left, and Maurice Mike, a student at Florida International University, wait in line at a job fair held by the Miami Marlins baseball team, at Marlins Park in Miami, Florida in 2013. A new study suggests that in the United States, college and university students must think carefully about their first jobs after graduation. People who take a job that does not require a degree can find themselves in lower-paid positions than their educated peers even five or ten years later, researchers say. Burning Glass Technologies and the Strada Institute for the Future of Work partnered to create the report, released in May. Burning Glass is a software company that researches the labor market. The Strada Institute is part of the Strada Education Network, a national nonprofit organization that supports the growth of education in the United States. The study is based, in part, on data gathered from U.S. companies’ job advertisements and workers’ employment and education histories. Researchers used special software to examine advertisements listed on nearly 50,000 job search websites between 2010 and 2017. They also looked at the résumés of almost 4 million American workers dating from 2000 to 2017. 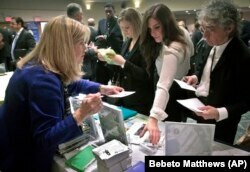 Patricia Mazza, left, meets job seekers, including recent college grads Ashley Deyo, 22, second from left, and Chyna Dama, 23, second from right, during a 2012 National Career Fairs' job search event in New York. The high percentage of underemployed college graduates may not come as surprise, says a top official at the Strada Education Network. Michelle Weise is the senior vice president of workforce strategies. Some of the data from the study comes from a time when the U.S. economy was facing a serious recession and jobs were limited. But Weise points out that, in general, many kinds of jobs require little to no formal education. These include jobs in fields like food service or physical labor. The problem, she says, is the serious and possibly long-lasting effects of choosing such a job. For one thing, there is a major difference in how much money underemployed and fully employed graduates are likely to make, Weise notes. The researchers’ study of U.S. government data on pay suggests that recent graduates of bachelor’s degree programs who are underemployed earn about $10,000 less, on average, than the fully employed. Weise says the other issue is that underemployed graduates will likely be stuck in positions that do not use their education. The study showed that about two-thirds of graduates whose first jobs do not require a degree will still be underemployed five years later. And about three-fourths of that underemployed group are likely to remain underemployed for at least another five years after that. In a way, both the students and the schools are responsible for solving this problem, Weise argues. She says students need to be thoughtful about their career path, especially while they are still in school. The sooner they start considering the steps they need to take to help find a job after graduation the better. These steps include asking professors for advice and seeking out internships. And Weise suggests that if they can, recent graduates should not simply accept the first job offer they receive. Having the desire to work is important, but so is waiting for a job that could lead to better positions in the future. Martina Ryberg, right, of Plymouth State University talks with Tara Rossetti of On Call International during a 2012 job-finding event for college students in Manchester, New Hampshire. Field of study is also important, she says. The Strada and Burning Glass study found that graduates with degrees in science, technology, engineering or mathematics are less likely to be underemployed. And students who earn degrees in a liberal arts field, such as history, may have a harder time finding a job that uses their abilities. But Weiss argues that colleges and universities also have to do better to support liberal arts graduates in their job search. Another expert points out that underemployment is also connected to how higher education operates in the modern world. Peter Cappelli is a professor of management at the Wharton School of the University of Pennsylvania. He says asking students to start preparing earlier to enter the workforce is only part of the solution. Cappelli notes that in recent years colleges and universities have worked hard to make higher education available to more people. But as the number of degree-holders nationwide has increased, graduates may find it harder to make themselves appear more desirable than others with a similar degree. Also, employers have increasingly come to expect more from graduates, somewhat unfairly, Cappelli says. For example, many advertisements for positions that normally would be perfect for recent graduates now ask for years of experience. Cappelli says that, to make themselves more competitive, college students can seek to gain skills outside of their normal study program. For example, liberal arts students might consider taking classes in computer programming during the summer break. And all workers should continue to seek ways to improve and expand their skills throughout their careers, he says. Daniela Silvero, left, an admissions officer at ASA College, discusses job opportunities with Patrick Rosarie, who is seeking a job in IT, during JobEXPO's 2012 job fair in New York. ​Is higher education still a good investment? The concern about underemployment may make some people wonder whether a college degree is still worthwhile. Nicole Smith says she understands why students and parents would ask that question. Smith is the chief economist for the Georgetown University Center on Education and the Workforce in Washington, D.C.
She admits that a traditional four-year degree is not the only path to a meaningful and well-paying job. And, she notes, as the cost of higher education continues to rise, families need to think carefully about the investment. But Smith stresses that the majority of well-paying jobs in the future will require some kind of degree. She says people need to consider how higher education might help them in the end. “We don’t want to discourage people from even stepping foot through the door or to discourage people from even thinking of that opportunity,” Smith said. In addition, Smith says, readers need to look at reports such as the Strada and Burning Glass study with a critical eye. She notes that researchers and employers may have different ideas about the jobs recent college graduates can do. In other words, the report’s definition of “underemployment” may not be entirely correct. Also, Smith argues many recent graduates choose jobs that do not require a college degree so they can more deeply explore their interests and identities. This period of exploration can help them in the end by teaching them more about what they do and do not want in a career. I’m ­Pete Musto. And I’m Dorothy Gundy. Pete Musto reported this story for VOA Learning English. Kelly Jean Kelly was the editor. We want to hear from you. 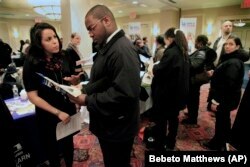 How common is it in your country for college or university graduates to be underemployed? Write to us in the Comments Section or on our Facebook page.